Congratulations! 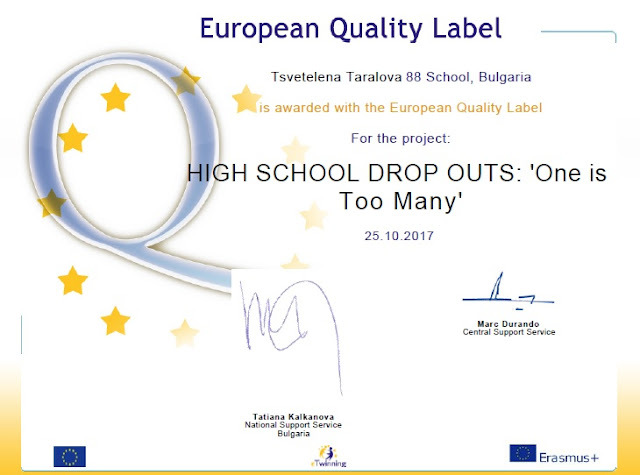 Your school has been awarded the European Quality Label for the excellence of the work in the eTwinning project "HIGH SCHOOL DROP OUTS: 'One is Too Many'". This means that your work, the work of your students and your school have been recognised at the highest European level. As a result you will receive a certificate which you can attach to your website(s) and display in a prominent position in your school. Also, your project will be displayed in a special area on the European Portal at www.etwinning.net. Once again congratulations on this unique achievement and I hope that we may meet at one of the eTwinning events during the year.